The streetcar lines Seattle is building make little sense as people-movers. To date they have spectacularly failed here as mass transit. But what if that's not the point? Mayor Jenny Durkan should have gone with her first instinct. She should have scrapped the Seattle streetcar. The desire to keep going no matter the cost is understandable. The argument is that we’ve already got truncated streetcar lines in South Lake Union and on First Hill. Surely connecting them will bring meaning to it all. Of course it was our fathers and grandfathers who ripped out the old streetcar tracks that once traversed Seattle, on account of them being obsolete. I imagine they’re looking on from the afterlife at the new tracks being laid, and wondering about our faculties as well. Because streetcars, no matter how lovable, are slow and inflexible. They’re not mass transit (at least how we run them here). There’s proof of this in studies, as well as from underperforming lines all over the country. But most crucially the proof is right here under our noses. Since 2007 we’ve been running street cars in Seattle. They have consistently cost more than predicted, and carried far fewer riders than expected. Most importantly, they’re failures as transit by the city’s own data. Consider the “Semi-annual Streetcar Report,” which the city put out in November, and which unfortunately was widely ignored. It shows in gory detail how rapidly costs have escalated and red ink has hemorrhaged as people choose not to ride. Example: The South Lake Union line has lost 28 percent of its ridership since 2013. This though it runs through the fastest-growing neighborhood in America. At the same time, its operating costs have gone up 30 percent. So the city revealed in November it now expects this line to rack up $12 million more in operating deficits in the next five years. And that’s the superior of the two lines. The First Hill trolley’s fare revenue is coming in less than half what was projected just 18 months ago. The result is the city projects $16 million in red ink on that line in the next five years, despite Sound Transit putting in $25 million to prop it up. The city also now says the First Hill line won’t carry the 1.3 million annual riders it was supposed to have this year until … well, possibly never. Fine, you say, these streetcars may be lame. But that’s only because they don’t go anywhere! When they’re linked — South Lake Union through downtown to Pioneer Square — then people will use them. That’s the hope. But they’ll still be pokier than a bus. For the sections stuck in traffic, they can be even slower than going on foot. A Seattle Weekly reporter road-raced the First Hill trolley on its 2.5-mile route and beat it by eight minutes. But here’s the clincher: the South Lake Union streetcar is going to be made redundant by the light-rail line through that neighborhood that voters have already approved. That’s slated to be built on the exact same alignment down Westlake. The South Lake Union streetcar is already being out competed by buses. Imagine when you can hop light rail from Amazon to Pioneer Square — why would we need this north-south streetcar route then? But then again, it turns out I’m thinking about it all wrong. 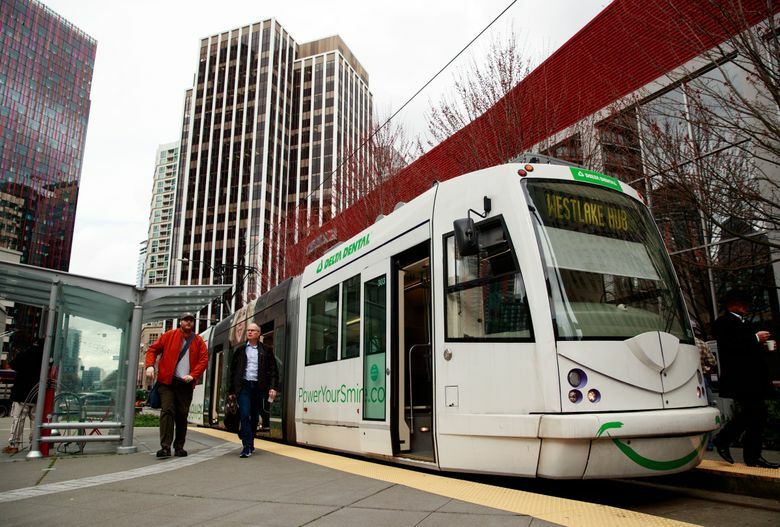 Recently two professors looked at 12 U.S. streetcar systems, including Seattle’s, and found they aren’t even really transit projects at all. “We find that new streetcar investments no longer primarily improve transit accessibility,” said the authors, writing in the Journal of Transport Geography. “Rather, modern streetcars are part of strategic amenity packages cities use to achieve real estate and economic development goals. Ah, that explains it. Seattle’s long-suffering downtown-property interests need a hand up. Seriously, City Hall: Spend the money on bus rapid transit, or speeding up light-rail construction, or really anything else. But if you must have this shiny bauble for downtown, at least charge the people who will truly benefit from it. Which isn’t likely to be our children and grandchildren — unless they’re related to someone who owns a skyscraper.